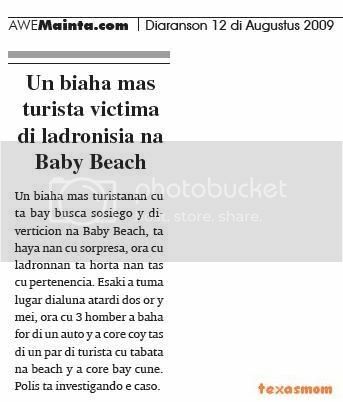 one tourist mericano cu owing to bay swim cu his child, owing to ask asistencia of police for one caso of ladronisia. police is bay at eagle beach, fast la cabana y eynan they're talk cu the tourist mericano, that is tell police cu past owing to let his bag on beach one rato for bay swim cu his child y hour cu past owing to go back, ladronnan owing to bay cu his bag. in the bag the had key of bedroom, key of the v-car, creditcard y 50 dollar. the caso is in investigacion. he j.de la c. naci at sand domingo of 48 year, is bay keep of san nicolas y is haci denuncia of ladronisia of some material of baseball for of his pickup, f-150. the is tell cu past owing to stop his pickup at height of veld of kudawecha, y in his baul the had one cantidad of articulo of baseball. 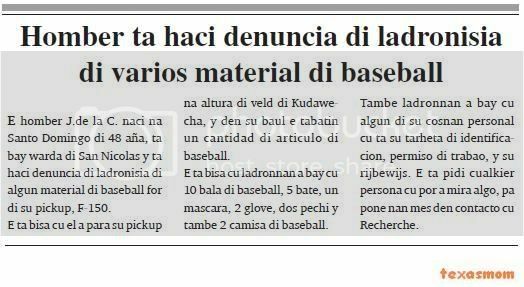 the is tell cu ladronnan owing to bay cu 10 ball of baseball, 5 bate, one mascara, 2 glove, two pechi y also 2 camisa of baseball. also ladronnan owing to bay cu some of his cosnan personal cu is his tarheta of identificacion, permission of trabao, y his rijbewijs. the is ask cualkier person cu can owing to see algo, for place they self in contacto cu recherche. 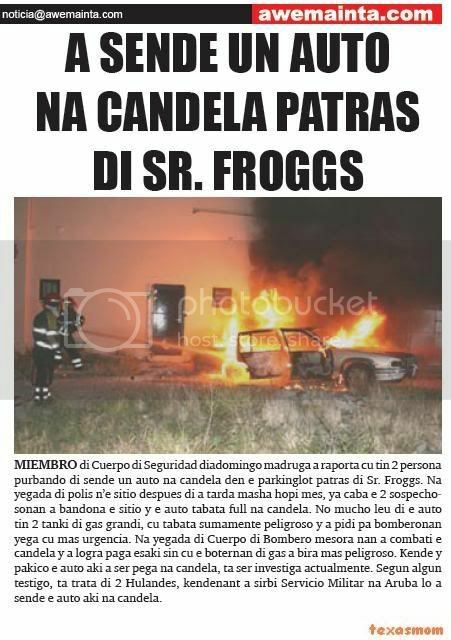 acolyte of cuerpo of seguridad diadomingo madruga owing to raporta cu have 2 person purbando of sende one car at candela in the parkinglot behind sr. froggs. at arrival of police n’e sitio after of owing to tarda very much self, already end the 2 sospechosonan owing to bandona the sitio y the car was full at candela. not mucho far of the car have 2 tanki of gas big, cu was extremely dangerous y owing to ask for bomberonan arrive cu more urgencia. at arrival of cuerpo of bombero at once they owing to combati the candela y owing to succeed pay this without cu the boternan of gas owing to become more dangerous. 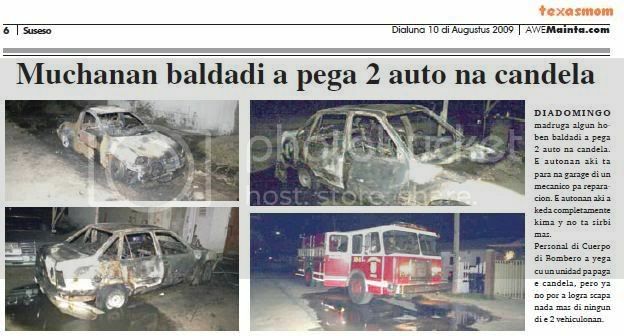 that y pakico the car here owing to being stick at candela, is being investiga actualmente. according some witness, is deal of 2 dutch, kendenant owing to serve servicio militar at aruba will owing to sende the car here at candela. diadomingo madruga police attentive owing to stop one car cu was actua very sospechoso y during of one control owing to come descubri cu his papelnan do not at ordo. hour owing to throw view in the car owing to succeed achieve also one arm blanco y this also owing to stay confisca. police is follow cu the investigacion here. diadomingo madruga some young baldadi owing to stick 2 car at candela. the autonan here is stop at garage of one mecanico for reparacion. the autonan here owing to stay completamente burn y do not serve more. personal of cuerpo of bombero owing to arrive cu one unidad for pay the candela, but already not can owing to succeed scapa nothing more of none of the 2 vehiculonan. cuerpo of bombero had very trabao diadomingo madruga, where they have to owing to leave for several candela. so cuerpo of bombero owing to achieve they're bay pay one candela of forest cu is intencionalmente cendi behind ezee brothers at eagle. according testigonan here will is deal of some young on scooter coriendo rond in becindario y they was dedica they self at light candelanan dangerous. here bomberonan owing to bay for of 2 trip for pay the candela behind the business menciona. 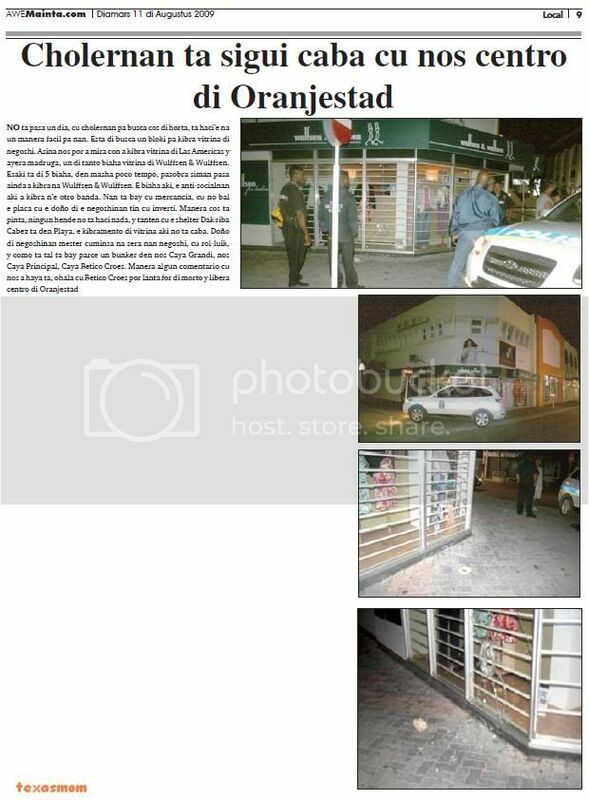 diabierna madruga for 3’or one guardia owing to ask asistencia of police of oranjestad, for one caso of ladronisia, y also menasa cu arm of candela. n’e lugar police is come across cu the guardia, that is tell police cu the was controlando the business his fast y owing to see cu one rato first, 6 boy delega, some pia‘bao y the others cu slof, dress cu short y t-shirt, is march in becindario. the is tell police cu hour the was fast of the business, past owing to hear the alarma bay y owing to core bay see kico is pasando. behind the edificio the owing to come across cu one boy canando cu the box of coin in his hand, while cu one man cu owing to descend for of one nissan centra berde owing to come on dje cu arm of candela y owing to menase. at once the another child hombernan also owing to core enter in the car y they owing to bay for of the sitio. police owing to calling the owner of the lugar, that owing to come n’e sitio. past owing to tell police cu in the box had 400 guilder. also past owing to tell cu the ladronnan owing to bay cu 2 boter of wine. police owing to achieve evidencia y is follow cu the investigacion. diabierna madruga 3.34 he m.t, is bay keep of police of beach y is tell police cu past owing to wordo atraca. the is tell police cu past owing to bay in ranchostraat for bay cumpra his base, y one choler owing to atrake y owing to less 25 guilder for of dje. police owing to see cu m.t. was enough sober y owing to bise p’e mihor bay cas sosega his curpa. monday nightfall owing to start one discucion among one choler female y another choler masculino. the discucion here owing to escala till become one action serious, where cu dado instant owing to bay over at throw one baranca on another, but this owing to bay strike y destrui the vitrina of the business icr tech. y not can haci mucho debi cu already aruba do not one happy island more but owing to become aruba owing to choller’s paradise. the cholernan here is goza of the previlegio of can bath y come in the shelterhouse, roof on cabez y husticia not can haci they just nothing. 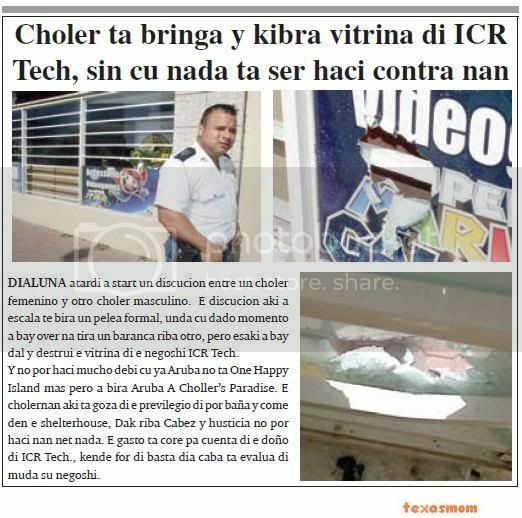 the gasto is core for cuenta of the owner of icr tech., that for of enough day end is evalua of muda his business. do not happen one day, cu cholernan for busca cos of steal, is haci’e at one as facil for they. esta of busca one bloki for break vitrina of business. so we can owing to see con owing to break vitrina of las americas y yesterday madruga, one of tanto trip vitrina of wulffsen & wulffsen. this is of 5 trip, in very some time, because week happen still owing to break at wulffsen & wulffsen. the trip here, the anti-socialnan here owing to break n’e another near. they're bay cu mercancia, cu not be worth the coin cu the owner of the negoshinan have cu inverti. as cos is draw, none person do not haci nothing, y adieu cu the shelter roof on cabez is in beach, the kibramento of vitrina here do not end. owner of negoshinan have to cuminsa at close they business, cu rol-luik, y because; is such is bay seems one bunker in we caya big, we caya principal, caya betico croes. as some comentario cu we owing to achieve is, ohala cu betico croes can arise for of dead y libera centro of oranjestad. he j.c.b. is calling keep of police of north diadomingo morning 6.20 y is ask asistencia, because; cu past owing to wordo menasa cu arm of candela. the is tell police cu the live in heidestraat y dado instant two car, one tercel blauw y one sunny blanco owing to arrive stop fast cas of his neighbour y owing to cuminsa pour pita without stop. j.c.b owing to tell police cu past owing to bay close the hombernan in the car y owing to tell they for they stop of haci desorden. the is follow declara at police cu past owing to keep till hour cu the car owing to bay for of the sitio, for after past owing to march come bek his cas. one rato after, the same hombernan owing to go back, but the trip here, they owing to come at leg. one of the hombernan owing to saca one arm of candela, y cada trip was aim at on j.c.b. y was wing the gay of the arm. according j.c.b can owing to conclui cu the arm not was carga. the is tell cu past owing to core bay sconde behind one wall till hour cu they owing to bay. police have atencion of the caso. presencia of police owing to wordo ask diadomingo madruga 1.35 at one cas at savaneta, where ladronnan cu owing to fracasa of steal one car y so owing to cuminsa throw the owner of one car cu stone. 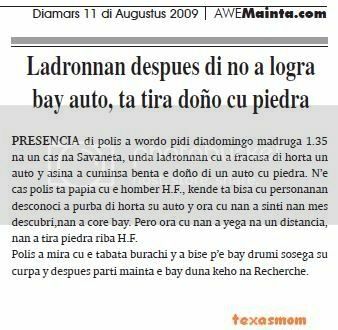 n’e cas police is talk cu he h.f., that is tell cu personanan desconoci owing to try of steal his car y hour cu they owing to feel they self descubri,nan owing to core bay. but hour cu they owing to arrive at one distancia, they owing to throw stone on h.f.
police owing to see cu the was sober y owing to bise p’e bay sleep sosega his curpa y after part morning the bay give complaint at recherche. SAN NICOLAS - The fraudulent Valero Aruba refinery workers have other false invoices prepared with data from existing businesses. They both Aruban and American companies. Auditors of the headquarters of the American oil company is currently auditing the accounts, so Amigoe also encountered. Through the mail received this newspaper and asked to respond on a payment of nearly 6,000 dollars to Valero Amigoe this year would have done. The money was transferred to a bank of JP Morgan Chase Bank, which was owned by a U.S. company Convergint Technologies. This company is not a client of Amigoe nor is ever amount to this newspaper account. From reliable sources within Valero Aruba, the editors received confirmation that this construction multiple times by the fraudulent employees have been applied. Separately, there is also fraud in contracts with subcontractors. In addition to the already fired manager of the maintenance department, is now also a member of the same section of suspected fraud. The practices of a security officer JM are now examined. Although Valero want nothing about the irregularities, the spokesman confirmed that they have the matter seriously. Moreover, a few months ago someone fired, allegedly because of fraud. Whether this is related to the research of today is not known. Prime Minister Nelson Oduber (MEP) left this morning on the radio to know that he knows nothing of the fraud. But he said last night a proposal by Petro China, one of the companies interested in taking over the refinery in San Nicolas. There would be almost consistent with the price, but do not have the legal details. Oduber said the positive finding that in addition to Petro China, two parties who want to buy the refinery and also own the necessary crude oil available. The refinery itself strong rumors circulating that in September the last month is that Valero paid. This is not confirmed by the company itself. Finally, says Prime Minister Oduber verdict expected today in the arbitration case that Valero had brought against the government because they pay BBO. The collision incident between Hendrik Croes and then Detective Edgar Maduro when officials strike led to the famous statement of chief officer Hans Mos that Croes' not just anyone would be. Striking officials were grateful of that decision. ORANGE CITY ¬ Edgar Maduro policeman is acquitted on appeal. This happened this morning, after he made earlier by the Court of First Instance was declared guilty of making false declarations to a lawyer and former Minister of Justice Hendrik Croes. Croes would Maduro when officials strike on March 16, 2008 have hit during a demonstration at the roundabout Paradera. Both the incident and its aftermath were a lot of eyebrows. It led to the infamous decision of chief officer Hans Mos that Croes' not just somebody was after more and more pressure came from the trade union officials to arrest him. Croes was a day before on an expensive cruise holiday was arrested and brought to KIA. Prime Minister Nelson Oduber and a large group of MEP supporters were then demonstrating for his release. A few days later Croes was released and continued his cruise in Patagonia. In July last year Croes was acquitted for attempted manslaughter by driving after an accident and endangering the safety of traffic. Maduro was the same judge, guilty of making a false declaration. The Court in First Instance had Maduro initially to four months conditional, three years probation and 160 hours community service sentences. But preferably thirteen witnesses were heard during treatment. Maduro did not accept the verdict and lodged an appeal. During treatment yesterday by the interim Attorney-General Maduro inconsistencies in Edgar's story noted. Maduro Thus, instead of directly to the hospital to be lost after the incident, no problem walking and witnesses searched. Croes was at the time of the strike the government lawyer and Maduro was a member of the police union well have been aware of him who would have reason, in contrast to his statement that he did not know who the driver of the car was. Maduro claim that he himself was the incident as an attack it. Croes would have hit him and then tried Maduro him out of the car to have run. If the collision on a straight road had been in place on a roundabout, then he had probably not survived. His lawyer, Edwin Duijn Field was a pity that the Public Ministry in many ways attempted to Hendrik Croes outside shot to keep. He was the declaration of Croes that he had not seen an agent for his car and stood him to stop Has strange. The indictment of the OM for false declaration is wrong, says the adviser. He could Maduro to make the declaration to have been aware of the fact that any unlawful act would be. In addition, the pump of thirteen witnesses to correct a clear picture as possible. The decision of chief officer Hans Mos during Croes' arrest that the lawyer "is not just someone" was a clear sign of preferential treatment by the OM says Duijn Field. A rationale for the decision of the Court and a common reaction of the OM were at the time of this edition is not yet available. Maduro wants to be themselves no further legal action. Hendrik Croes has run a civil case against Maduro because of false accusation. 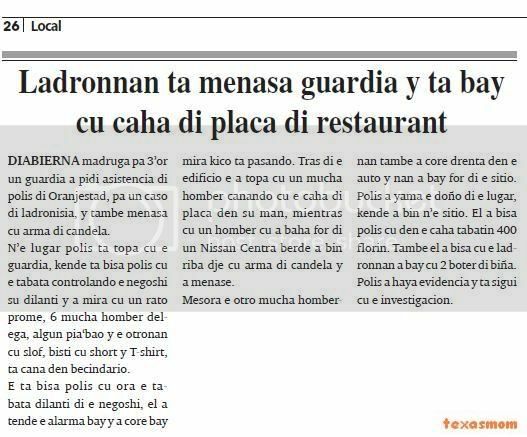 oranjestad (aan): again owing to worde reporta another caso relaciona cu abstraction on beachnan. esnan cu is visit beachnan as east y pabao of bridge not have tranquilidad. not can let just net nothing in car y niether on beach. this is debi cu have person, pareha, are is opera for hit esnan cu is visit disfruta of we beachnan. even on internet, have cantidad of “warning” poni, where turistanan is adverti another cu hour they come aruba, for watch-out for “petty theft” of articulonan let in car hour of bay beach at aruba, y besides the reclamo cu polisnan at aruba do not haci nothing. the trip here, personal of strandpolitie owing to worde instrui for central of police for bay atende one of the tantisimo casonan of ladronicia on beach. the trip here malmok not owing to stay afor! at arrival, police owing to atende he tourist of inicialnan b.s. naci at merca y the have 32 year of edad. according version of the bishitante, cu more or less 10:30’or the morning ey, past owing to arrive at the beach for disfruta of sea together cu his casa. on beach they owing to let they bag y despite cu they owing to enter sea, they was throw view y in careda of 11:45’or past owing to leave for of sea after of owing to throw cabez past owing to stay hand at cabez already cu the bag owing to desaparece. in the bag according bishitante denunciante, have two rijbewijs, two carchi of arubus, key of camber, two tarheta of credit card more 260 dollar cash. polisnan because; strandpolitie cu did take denuncia oficial of the tourist mericano cu is the tantisimo victima of ladronicia on beach without count ; the cantidad of localnan cu also is abide at hand of the thief (nan). for some time end according informe will have among another one pickup color grey sospechoso is circula in cual owing to señala one man y one muher tanto east y pabao of bridge in areanan of beach. 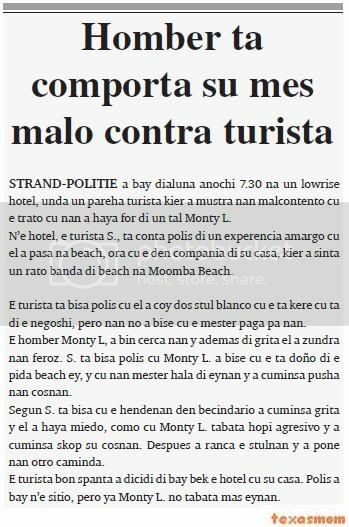 strand-politie owing to bay monday night 7.30 at one lowrise hotel, where one pareha tourist wanted owing to show they malcontento cu the trato cu they owing to achieve for of one such monty l.
n’e hotel, the tourist s., is count ; police of one experencia amargo cu past owing to happen at beach, hour cu the in compania of his casa, wanted owing to sit one rato near of beach at moomba beach. the tourist is tell police cu past owing to coy two chair blanco cu the is believe cu is of the business, but they not owing to bise cu the have to pay for they. he monty l, owing to come close they y apart from bark past owing to zundra they feroz. s. is tell police cu monty l. owing to bise cu the is owner of the piece beach ey, y cu they have to wing of eynan y owing to cuminsa push they cosnan. according s. is tell cu the hendenan in becindario owing to cuminsa bark y past owing to achieve fright, because; cu monty l. was much aggressive y owing to cuminsa skop his cosnan. after owing to ranca the stulnan y owing to place they another caminda. the tourist good spanta owing to dicidi of bay bek the hotel cu his casa. police owing to bay n’e sitio, but already monty l. not was more eynan. amsterdam - more cu 750 kilo of cocaina more one cantidad of 3000 kilo of hash, 39 kilo of heroin, thousand of pildora of xtc, one revolver, one pistol, one seedoo, y documentonan y several pc, is thing autoridadnan of one team internacional, consistiendo of autoridadnan spanish y britanico owing to come confisca on one yacht belero, because; on ground at europa. one overall of 47 sospechoso owing to stay deteni, bao of cual tripulantenan of the yacht cual is two man antillean procedente of sint maarten. the detencionnan owing to being realisa ribe the yacht y also at ground at spain because; at inglatera in transcurso of tuesday ultimo. 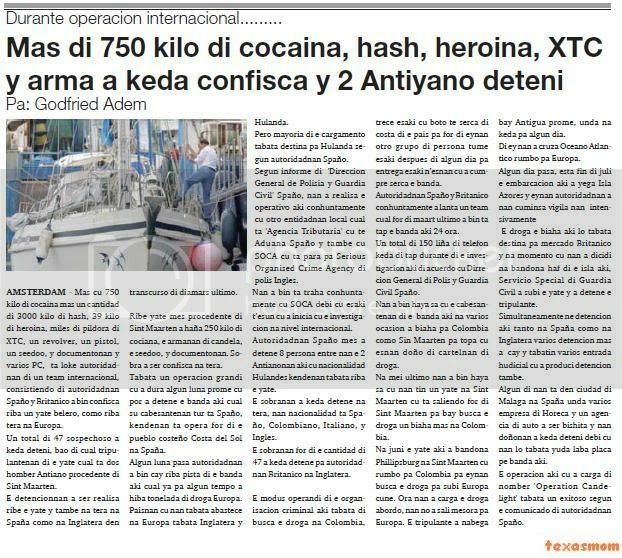 ribe yacht self procedente of sint maarten owing to find 250 kilo of cociana, the armanan of candela, the seedoo, y documentonan. sobra owing to being confisca at ground. was one operacion big cu owing to last some month first cu can owing to detene the near here cual his cabesantenan all is spanish, kendenan is opera for of the people costeño costa del sol at spain. some month happen autoridadnan owing to come cay on pista of the near here cual already for some time owing to take away tonelada of drugs europa. paisnan cu they was abastece at europa was inglatera y the netherlands. but majority of the cargamento was destina for the netherlands according autoridadnan spanish. according informe of 'direccion general de polisia y guardia civil' spanish, they owing to realisa the operativo here conhuntamente cu another entidadnan local cual is 'agencia tributaria' cu till aduana spanish y also cu soca cu is stop for serious organised crime agency of police english. they owing to come is work conhuntamente cu soca debi cu this t’esun cu owing to inicia cu the investigacion at level internacional. autoridadnan spanish self owing to detene 8 person among they the 2 antianonan here cu nacionalidad dutch kendenan was on the yacht. the sobranan owing to stay detene at ground, they nacionalidad is spanish, colombiano, italian, y english. the sobranan for of the cantidad of 47 owing to stay detene for autoridadnan britanico at inglatera. the modus operandi of the organisacion criminal here was of busca the drugs at colombia, trece this cu boat till serca of costa of the country for for of eynan another are of person tume this after of some day for entrega this n’esnan cu owing to cumpre serca the near. autoridadnan spanish y britanico conhuntamente owing to arise one team cual for of march ultimo owing to come is tap the near here 24 hour. one overall of 150 cord of telephone stay of tap during of the investigacion here of acuerdo cu dirrecion general of police y guardia civil spanish. they owing to come achieve know cu the cabesantenan of the near here at several ocasion owing to trip for colombia because; without maarten for come across cu esnan owner of cartelnan of drugs. at half ultimo they owing to come achieve know cu they have one yacht at sint maarten cu is saliendo for of sint maarten for bay busca the drugs once more at colombia. at june the yacht here owing to bandona phillipsburg at sint maarten cu direction for colombia for eynan busca the drugs for lever europa cune. hour they owing to carga the drugs abordo, they not owing to leave at once for europa. the tripulante owing to nabega bay antigua first, where at stay for some day. of ey they owing to cruza oceano atlantico direction for europa. some day happen, esta end of july the embarcacion here owing to arrive island azores y eynan autoridadnan owing to they cuminsa vigila they intensivamente. the drugs the trip here will was destina for market britanico y at instant cu they owing to dicidi at bandona harbour of the island here, servicio special of guardia civil owing to lever the yacht y owing to detene the tripulante. simultaneamente ne detencion here tanto at spain because; at inglatera several detencion more owing to cay y had several entrance hudicial cu owing to produci detencion also. some of they're in town of malaga at spain where several empresa of horeca y one agencia of car owing to being visit y they doñonan owing to stay deteni debi cu they will was help wash coin pe near here. the operacion here cu owing to carga of name 'operation candelight' was one exitoso according the comunicado of autoridadnan spanish. monday afternoon, strand- politie owing to bay at one highrise hotel, for asisti one guardia of one highrise hotel, that owing to sorpende one man cu drugs. 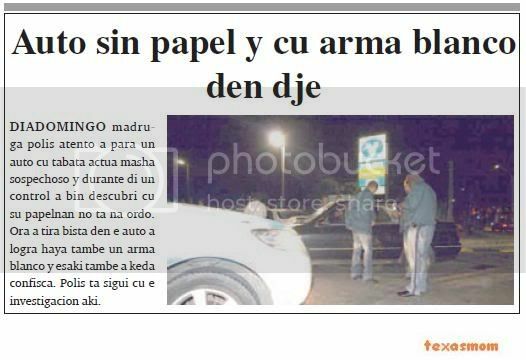 n’e sitio, police is come across cu the guardia that had he r.r.a naci at aruba of 32 year deteni. the is tell police cu past owing to achieve he cu 4 saco of marihuana in his posicion on beach. police did take he y drugs for of the bewaker. once more turistanan cu is bay busca sosiego y diverticion at baby beach, is achieve they cu surprise, hour cu ladronnan is steal they bag cu pertenencia. this did take lugar monday nightfall two or y half, hour cu 3 man owing to descend for of one car y owing to core coy bag of one pair of tourist cu was at beach y owing to core bay cune. police is investigando the caso. monday nightfall for 4.30, he j.t.d. 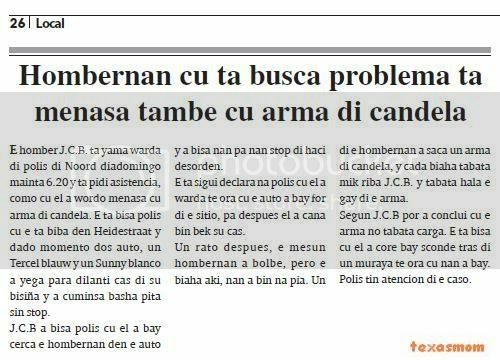 naci at haiti is bay keep of police at san nicolas y is tell police cu the is bay give complaint of violencia publico contra his person. the is tell cu saturday night, the was sit fast of napa car parts at cura cabay y of ripiente 3 muher owing to come on dje y owing to dune one good beat sorprendentemente. the is tell cu the muhernan live fast of the business. the is tell cu the muhernan owing to leave of they cas y owing to come on dje, y owing to cuminsa bati’e. the is tell cu the muhernan owing to believe cu the is one peeping tom. Page created in 5.266 seconds with 19 queries.